Well happily, the sun has started to shine in Buckinghamshire, and all the flowers have responded by bursting forth! Some more dahlias have emerged over the last few days. Only one or 2 here and there, but they are absolute beauties and a really encouraging sign of what is to come later in the season. Last year the flower that I fell utterly in love with was the Dahlia Cafe au Lait. I had one in a large pot outside my back door and swooned every time I looked at it. It flowered from early July right through to the first snow in November. I thought that nothing could surpass that beauty….but something has. This year I bought a few Dahlia Labyrinth tubers, and the first flower has just come through. I wish I had bought more. This flower is magnificent! Feast your eyes! This morning I dropped in a large bunch of flowers to the pre-school my youngest daughter goes to as they have a weekly delivery every Monday morning. I collected the bunch from last week and here it is one week on. I must admit that I snipped off some campanula and foxglove flowers that were going a bit brown, and took the petals off the knautia so the round seed heads are exposed, but have done nothing else at all. I’m so pleased with how it looks after a whole week without a water change. Which has lead me to wonder how much changing the water has an effect on the longevity of the flowers. I never change the water at home (bold! ), but I do top it up as some flowers can be really thirsty. This week I am going to put together 2 identical small bunches of flowers and keep them in the same place, change the water in one every second day, but do nothing with the other. It will be interesting to see the difference in the length of time the flowers stay looking good. Well this week has been all about getting The Hidden Gate Blooms website up and running (currently still very much under construction!) and getting ready for the British Flowers market that is being held in Henley tomorrow as part of the Chelsea Fringe festival. 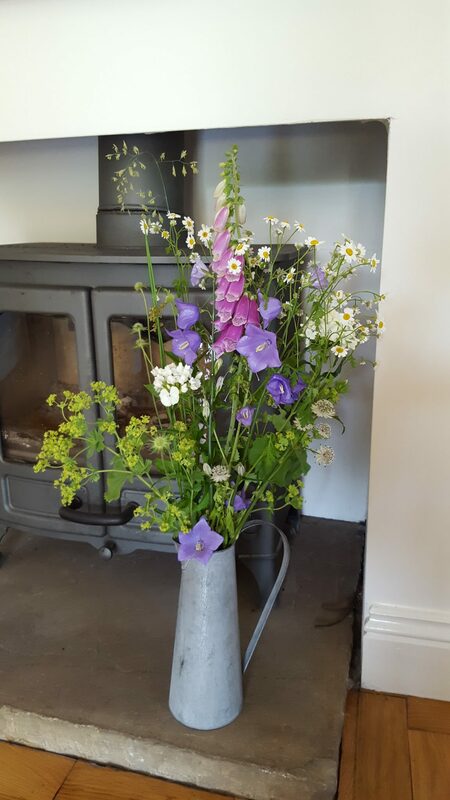 I will be selling lots of plants and a few beautiful bouquets – some with a British wildflowers twist. I will post some pictures tomorrow morning when it all comes together. It has been great to have the market as a focus to organise all of my plants. I have way more dahlias than I have space for in my allotment & garden, so it has been good to sort through them all and work out which ones I can part with. 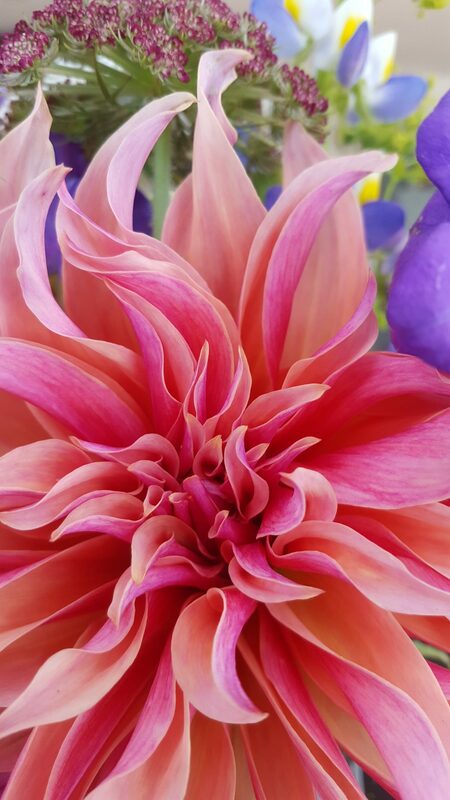 The dahlias that I will be selling tomorrow are ‘Cafe au Lait’, ‘Fleurel’, ‘Myrtle’s Folly’, ‘Eveline’, ‘Wine Eyed Jill’, ‘Gerrie Hoek’, ‘Peaches’, ‘Preference’ and ‘Blue Bayou’ all in 2-3 litre pots for £4.50 each. I also have some lavender, nicotiana sylvestris, achillea & snapdragons and am hoping to go home with just empty crates. Although if any of the other sellers there have anything interesting I’m sure I could be convinced to take a couple more plants home with me! All the plants in the allotment are really starting to come on, and I think I will start cutting sweet peas in the next couple of weeks, which will be lovely. I hope to start selling posies online before the end of June, so watch this space!